Download Festival 2018. What a year. As the curtain closes on yet another successful year at Donington Park we hit you with the first of three review features which will take you through in depth analysis of each day as well as a special piece to round things off... more of that soon. Our review begins then with a band who we pinpointed in our Preview feature as being quite often overlooked in the face off a brand which effectively outgrew the music. 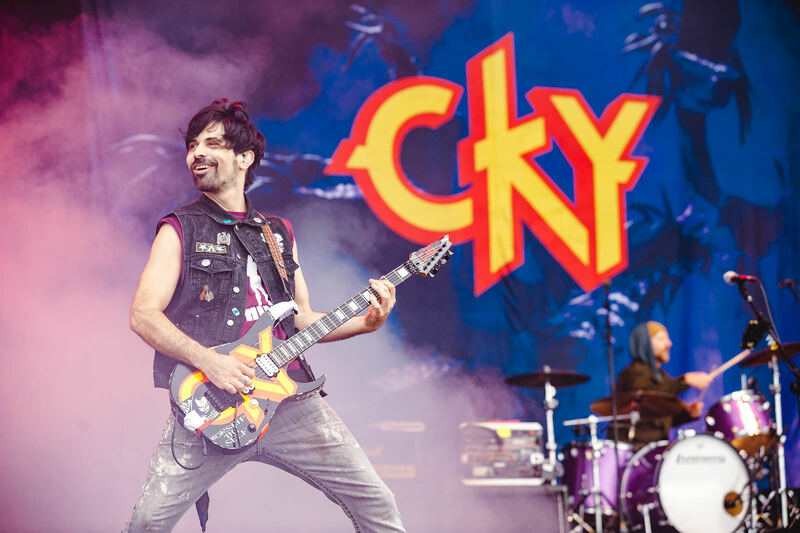 CKY (9/13) are currently operating as a three-piece with the departed vocalist/guitarist Deron Miller forcing Chad Ginsburg to step up on the microphone. It was encouraging to see such a large crowd congregate towards the Zippo Encore Stage for this set and was doubly good to see so many people singing along to some of the band's newer material. The classics like 96 Quite Bitter Beings and Flesh Into Gear of course garnered the biggest reaction but generally speaking the band sounded tight throughout. There is a level of aggression that has been lost somewhat in the live performance with Miller no longer around but this was a strong set from a band who have widely considered to be a little hit and miss in the live environment. Shuffling around towards the Main Stage, Marmozets (10/13) showed exactly why they're continuing on their path towards potentially becoming one of the biggest Rock bands this country has ever produced. Having this Main Stage slot alone was absolutely huge, and it was genuinely impressive to see the kind of numbers they drew for a mid-afternoon slot. Whilst their latest record hasn't lit the world on fire quite in the same manner as their debut - yes, this is a band who have smashed their way on to the Main Stage after just two records - the newer material actually sounded a lot better live. This was a set driven by momentum, as the tracks went by they gained more and more and by the end it felt too soon that it was all over. Incredibly well deserved slot and an exciting stepping stone on the Marmozets journey. As the Marmozets closed out on the Main Stage, Andrew W.K. (8/13) was launching himself in to full on party mode back on the Zippo Encore. He was able to attract an enthusiastic enough crowd but for the most part the set felt a little lacking until the double salvo of We Want Fun and Party Hard. Whilst this is due in part to his catalogue of tracks, a lot of it had to do with the pretty poor sound they had - it all just felt a bit quiet which left the party a bit flatter than he would've hoped. For our first foray in to the Avalanche Tent this weekend, Cancer Bats (9/13) attracted an absolute horde of people. The band are clearly on energetic form following the surprise release of their latest record The Spark That Moves and it was impressive to see so many singing along so enthusiastically to tracks so young. The band sounded good enough in parts but the sound mix felt a bit all over the places in parts - Liam's microphone being about a thousand times louder than everything else did hamper things somewhat. Utilising the incredibly useful walkway between the third and second stages, next up for us was a bit of Jonathan Davis (8/13) - a set which attracted a huge swathe of people (a lot of which were in Korn t-shirts) but didn't quite set the stage on fire. His new material is different, experimental and requires a bit of patience at times so in an environment largely made up of people casually wandering over out of curiosity more than anything the set didn't quite thrive. Next up were the first of the three major sub-headliners on the main stage with Bullet For My Valentine (6/13) who did their very best to bore everyone to tears. There was something oddly frustrating watching a band who have been handed chance after chance taking up one of the higher slots on the Main Stage even despite the rumblings that some of the newer material is at the very least of a higher standard than some of their other more recent output. As a performance it all just felt a bit stale and lacklustre - there didn't feel to be that element of competitiveness that every band playing at a festival should have, more just a standard plodding along until it was over. Moving around the crowd throughout the set, there were of course pockets of highly enthused BFMV fans but generally there was an apathetic atmosphere. Following on from them were the first of three huge headliners at Download Festival this year. 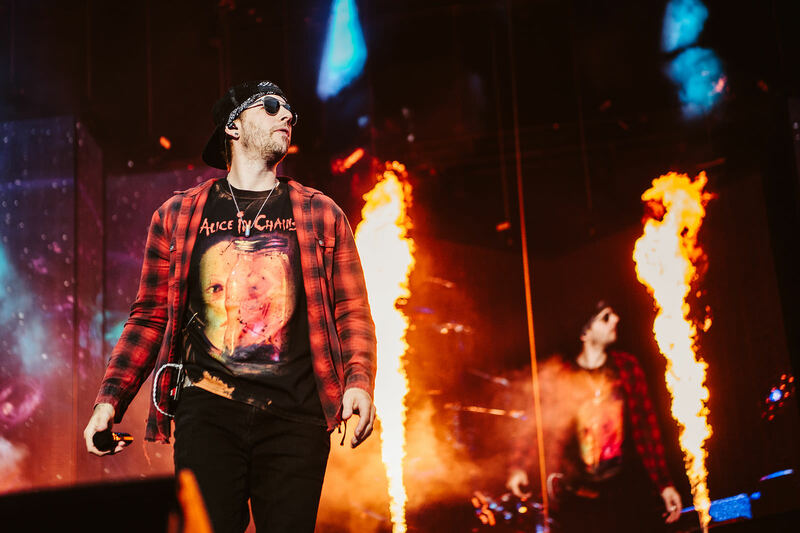 We speculated more than once in the lead-up to the festival whether this particular band were going to step-up and lay down the gauntlet at the feet of Guns N' Roses and Ozzy as if to say "follow that" but whilst enjoyable Avenged Sevenfold (9/13) were absolutely nowhere near either once the full weekend had played out. We'll obviously be going in to more detail on the other two later on but with Avenged Sevenfold this really and truly felt like a missed opportunity and that was the most disappointing result from it all. Even just saying that it feels like there are echoes from the first time the band headlined the festival - something many felt was a little too early for them but that next time they'll be primed and ready. Whilst their show has become far more honed and come on quite a lot, there was just something missing - whether that was the newer stuff just not really landing for the festival majority or the slow plodding tempo to the whole set it's hard to say. Blasting in to the arena early doors on Saturday, first port of call was the Main Stage for Canadian Rock unit Monster Truck (9/13) who drew a very large crowd despite the designated set time. The band have got a new record coming out this September and utilised this performance to showcase some of that material which by and large was received pretty well. In a world where there are literally hundreds of bands doing exactly what Monster Truck are doing right now, it would be easy to blend in to the rest of the beige, but thankfully they have a far more energetic and interesting approach. Strong set to kick off the day. Next up came one of the surprise sets of the weekend. That's not a statement questioning the quality of the band at all but when Corrosion Of Conformity (11/13) hit the second stage on a sunny Saturday afternoon (albeit very late), it was so thunderously brilliant it'd be downright stupid not to include this as one of the highlights of the whole festival. The band sounded absolutely perfect and as soon as the crunch of Pepper Keenan's guitar volleyed out of the speakers there was just a sea of slow head-banging heads. Quite noticeable as well was the fact that as far as sheer volume was concerned this was by some way the loudest set of the festival so far. Loud, brash, heavy with absolutely zero fucks given. What a band and what a set. Following on from them and in a completely different stratosphere as far as their sound is concerned was probably the best UK Bury Tomorrow (11/13) performance of recent times. With the absolutely gargantuan sized Guns N' Roses set-time later in the day it did mean a lot more had to be crammed in to a far shorter space of time, something Daniel Winter-Bates wasn't shy of expressing his disdain for. That fire and general feeling of being a bit pissed off only lent itself to a far more ferocious Bury Tomorrow hitting the stage, smashing their way through a set absolutely packed with crowd favourites amongst newer material. It was hugely encouraging to see the kind of reaction their final track of the day Black Flame got considering it's the title track from their new record. The sheer crowd size alone says it all as far as what kind of trajectory Bury Tomorrow are on at the moment. Immediately following on from these two massive sounding sets on the second stage were Grunge veterans L7 (7/13). For a band who are already beyond their heyday, the loss of drummer Demetra Plakas mere days before this show did hinder them quite a bit despite a strong effort by the replacement drafted in. Their momentum picked up towards the end of the set so was a shame they didn't have a little longer. Later in the day came a band who are so far on the other end of the spectrum to L7 it's borderline unbelievable. Baby Metal (10/13) ALWAYS bring a show at whatever festival they show up at. Whilst the narrative around their existence continues to rumble on without anyone having too much of a clue what it's all about, one thing is for sure they never fail at being entertaining. Once again a key part of a Baby Metal show is simply glancing across the crowd to pinpoint who is seeing it for the first time and having their expression turn from pure confusion to borderline elation. There aren't many acts around who can still deliver that kind of emotion. Following on from this came what many regarded as one of the most anticipated sets of the whole weekend. 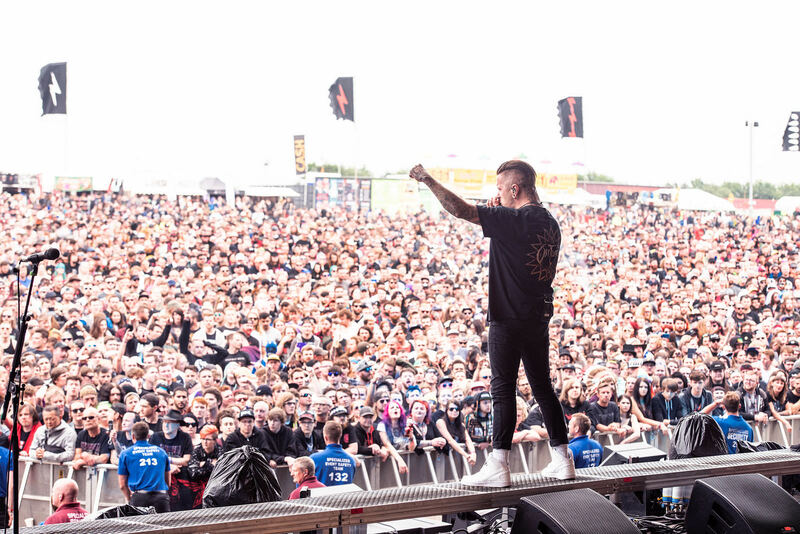 Parkway Drive (12/13) are in full on beast mode at the moment - the release of their record Reverance only a month before the festival has launched them in to a run of form many of their peers could only hope to replicate at the moment. Opening with the ferociously powerful Wishing Wells the band simply never looked back, launching themselves in to hit after hit after hit with plenty of pyro and fire to boot. Easily one of the best live bands around at the moment, despite an earlier headline slot on the second stage than they perhaps would have liked, it didn't stop them unleashing a full scale assault on the senses of every single person stood in front of them. Their forthcoming show at Alexandra Palace is going to be off the charts levels of huge. On then to the main event - the band who by some distance grabbed all of the headlines for Download Festival 2018 and absolutely ran with them. Many said it could never happen, at points it seemed this was definitely the case, but here were 100,000 Download Festival punters staring down the hill on to the Main Stage at Axl Rose, Slash and Duff McKagan standing side by side at Donington one more time. 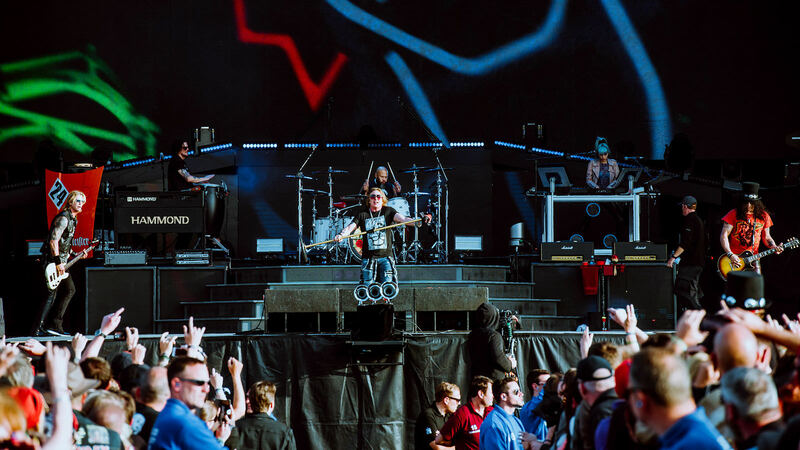 Guns N' Roses (12/13) generated an atmosphere across the festival unlike Download has seen for many years - that level of anticipation and pure excitement could literally be felt running across the site every single minute before they finally hit the stage. That level of power, that aura and ability to trigger such a level of emotion is testament to the legendary status Guns N's Roses rightly hold and when that opening bass line for It's So Easy thundered out of Duff's bass the place exploded. What followed was a set which was so perfectly paced despite it's three hour run time it felt like it had absolutely flown by at the end. We're talking about the ability to brazenly crack out Sweet Child O' Mine casually mid set, allowing Slash to fly off the handle more than once, whether it was through his Godfather solo or simply jamming at the end of tracks - keeping things constantly moving for each of Axl's at times hilarious costume changes was the name of the game and it absolutely worked. Each band member was given their time to shine and rightfully so. Axl's voice may not be what it once was but he hardly sounds like the car-crash many of us were greeted to during those live shows in the first decade of the new Millennium. He's a smart performer- he knows where to tweak his approach and knows exactly how to compliment the talent around him - a stark reminder that the cynical commentators got it all completely wrong on suggesting this tour would be all about him. The atmosphere that had been tense and nervous before they hit the stage became one of the biggest parties Donington has ever held. As a show it was brash, over the top, bloated with showmanship and frankly ridiculous at points - absolutely EVERYTHING you want from a Guns N' Roses show. © 2003 - 2013 RoomThirteen.com - all rights reserved.